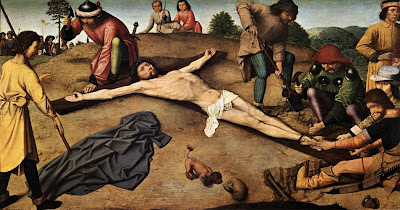 In these three Stations, we have all the events immediately surrounding the Crucifixion presented to us: Jesus is stripped of his garments, he is nailed to the Cross, and he dies. Certainly, these three Stations, and especially the 12th Station, are the heart of the Way of the Cross. Now, more than ever, we witness the infinite love of our Savior, and we are inspired to make an act of perfect love in return. In previous articles we considered the first, second, and third sets of three Stations each. It will now be particularly helpful to recall what we said in our introduction to St. Alphonsus’ Way of the Cross. The Doctor of Morals generally has only a brief meditation in which he does relatively little to “construct the scene” with his imagination, but instead tends to focus upon the affective elements (the internal movements of the will toward love, contrition, compassion, etc.). To this end, St. Alphonsus often gives a tropological or moral interpretation of the Station and then directs us to petition for some grace. Among the graces to plead, the grace of final perseverance (which is the grace of being admitted to heaven) is of highest importance and deserves special prominence. This is certainly one of the most vivid of the meditations which St. Alphonsus offers – speaking of how the “torn flesh” our Christ was dragged off the Lord's body together with the garments. How excruciating this pain must have been! The Teacher of Prayer, considering the terrible pains which our Savior endured, breaks his usual practice and directly addresses the faithful who are making the stations. Immediately, inspired by the affective movements of compassion and love, St. Alphonsus offers a moral interpretation of the event: As Christ was stripped of his garments, so may we be stripped of our attachments to the world. Being freed from the consolations of the secular world, we are then able to love the Lord more perfectly. All our efforts are directed to this one end: that we may place all our love in Jesus, who is so worthy of our love. As the 2nd Station begins the actual journey itself, since it is only at that time the Jesus takes up the Cross and starts along the Via Dolorosa; so too the 11th Station marks the end of that journey, since in his earthly existence the Savior will walk no more, having been firmly fastened to the Cross. The barbarous soldiers nail the Savior and leave him to die, but we do not now abandon him. Rather, considering the great love of Christ, we remain close to the Good Lord and offer him acts of compassion and love. Here we have the most moving sentiments of love, “nail my heart to thy feet, that it may ever remain there to love thee, and never quit thee again.” This is the whole petition of the 11th Station; after this, St. Alphonsus returns again to repeat his lines of love which come (with some slight variation) at the end of each Station. "At the end of life, you will be examined in love"
Notice again the incredible simplicity and brevity of St. Alphonsus’ meditations. Suggesting to our minds the core realities of the mystery of Christ’s death, the Teacher of Prayer does not dwell on details – yet, his concise words fill us with such grief! 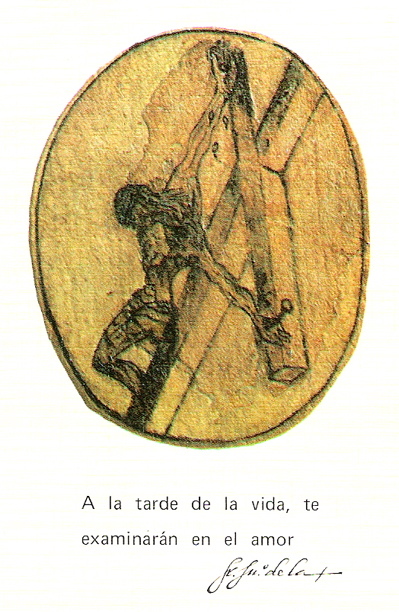 “After three hours of agony on the Cross” – St. Alphonsus follows the tradition, which is rooted in the Gospels, that the Lord hung upon the Cross from twelve until three in the afternoon. But St. Mark states that Christ was crucified at the third hour (Mark 15:25), which would seem to be around nine or ten o’clock. St. Thomas Aquinas, whom St. Alphonsus followed as a sure guide, tells us that the crowd crucified Christ in their hearts at the third hour, for it was then that they cried out, Crucify him! Crucify him! But, it was not till noon that the soldiers actually nailed him to the tree. The Douay-Rheims commentary, on the other hand, states that the period named after the third hour of the day extended till nearly noon – in this way reconciling the Gospel accounts.